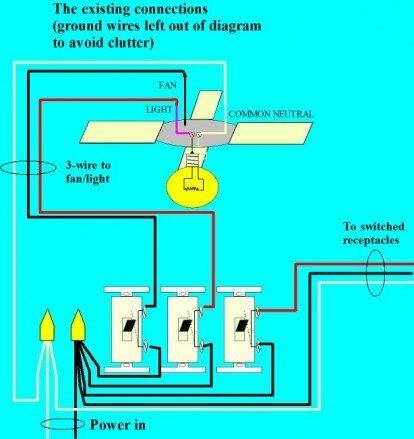 I have covered many different types of ceiling fan installations in prior website posts and in video, but this post will focus on taking an existing ceiling fan that is currently controlled by two wall switches, and converting it to a remote controlled ceiling fan c/w light kit. We will be using a universal remote control unit from Hampton Bay, Model #27157. 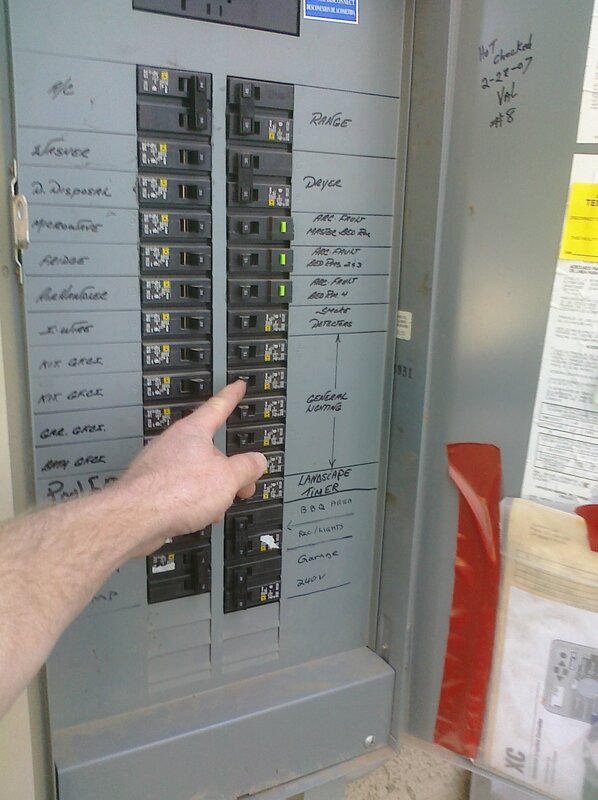 The first step (as always) is to determine what circuit breaker feeds power to the circuit we are working on, and shut off that breaker. For a quick review of safety considerations when working around electricity, CLICK HERE. 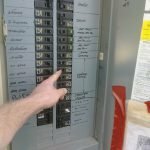 Now that the breaker is off, and the electrical panel is locked (if so equipped) so nobody can accidentally turn the breaker back on while you are working on the circuit you can safely begin working. 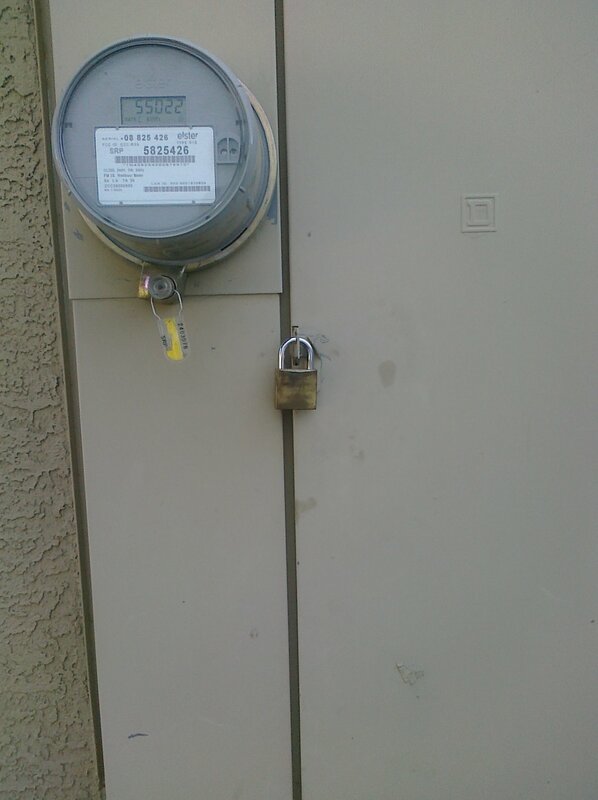 If you don’t have provisions for locking off the access to the panel, put a piece of electrical tape over the breaker handle holding it in the off position, and post a note warning others to leave the breaker off. The next step is to remove the canopy of the fan to check on the existing wiring, and plan for the installation of the remote control receiver unit. With this particular fan, a trim ring conceals the four mounting screws that hold the canopy cover in place. Turn the ring a ¼ turn until it comes loose and then remove the four screws. You only need to completely remove one of the screws on each side, and just loosen the other two that are through the key-hole, or L-slots in the canopy cover to allow it to drop out of the way, exposing the mounting bracket and the fan wiring. Determine how the fan is connected now. There is a 3-wire cable in the outlet box that provides a common neutral (white) wire, and the fan’s light kit is connected to the red, and the fan is connected to the black conductor. We only need one of these switched hot wires to act as the master power for the receiver unit. I will use the black wire (and the neutral conductor) to power the receiver, and the other wire (red) will be capped off with a wire nut and will no longer be used in this installation. 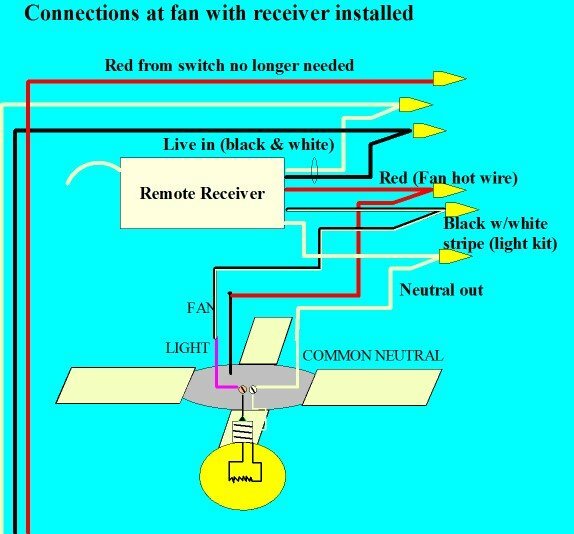 Here’s a diagram showing how the fan was connected to the switches initially. Now we disconnect the fan and light kit and prepare to install the remote receiver. The white wire from the supply cable will connect to the line in neutral, and the black wire will connect to the live in, or power in wire from the receiver. The neutral out from the receiver will now connect to the common neutral for the fan / light, and the black fan wire will go to the wire labelled ”fan” (red), and the blue light kit wire will connect to the wire labelled for the light. Here’s a diagram showing how the connections are made to the remote receiver. With all the connections made, we need to tuck the wires back into the box and install the remote receiver in the space available in the mounting bracket. This can be a difficult job to make everything fit, but it’s important that everything fits in nicely and that no wires are pinched or jammed in too tightly so to avoid any damage to the conductors, potentially causing a short circuit condition. When the remote receiver is installed and the canopy and trim ring are back in place, we can now make our changes in the multi-gang switch box. In this installation, the two switches that controlled the fan/light are in a 3-gang box that also has the switch for the switched receptacles in the room. Remove the faceplate and the device screws and determine that the switch that controlled the light has a red wire on one terminal, and the switch that controlled the fan has a black wire on one side of it. Both switches will have a black hot wire from the same hot splice connected to each switch. We want to remove the switch we no longer need, and cap off the wires with wire nuts. We are abandoning the red wire here as we did in the fan outlet. We will use the remaining switch as a master control for the remote receiver. I will move the switch we are still using to the middle position, keep the switch for the room’s receptacles in the first position, and then use a blank filler plate to fill the position of the switch we removed. With the switches back in place, and the faceplate installed, it’s time to check our installation. 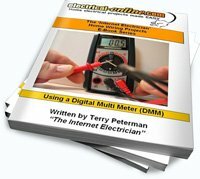 Restore power to the circuit and then turn on the master switch on the wall. The remote control should now control the operation of the fan and the light. The fan speed and direction will have to be set to the desired position using the pull-chain and reverse switch, and the light kit pull-chain will have to be on as well in order for the remote to work. Changing a ceiling fan to remote control is an excellent solution for many applications, but especially in a bedroom where the switch is by the entrance door. You can keep the remote on the bedside table, and have access to the light and the fan if needed in the middle of the night, without getting out of bed! If you aren’t comfortable and confident in safely completing a project like this on your own, use the box on the left of the page to find a reliable trusted licensed electrician in your local area. 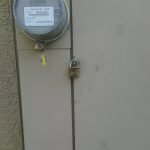 This entry was posted in How-To-Videos, Indoor Wiring and tagged ceiling fan, ceiling fan conversion, ceiling fan remote control, fan, remote control. Bookmark the permalink.